Opuntia is generally recognized as a fruit crop for semi-arid, subtropical conditions around the world. The majority of Opuntia plant biomass is palatable and is a cladode material rather than fruits which can be fed to livestock. An experiment was conducted on the Roodeplaat Experimental farm, situated north east of Pretoria, South Africa. Forty two Opuntia varieties were fed fresh to evaluate their palatability to dryland sheep. The experiment consisted of four Pedi sheep blocked according to weight in five camps containing three feeding troughs, where three different varieties were fed randomly on a daily basis. Each Variety was presented in a different camp in a different combination for five days. All varieties, except for Rubusta, were palatable and intake varied between 11.3 kg and 13.4 kg for the four sheep. The dry matter, crude protein-, ether extract, TNC and WSC of the different varieties were determined, but could not be linked to palatability. Big differences in yield were found between different varieties. Recommendations on further research regarding Opuntia are made in the paper. Opuntia (commonly known as prickly or cactus pear in South Africa) has been cultivated for its fruit worldwide and is adapted to semi-arid, subtropical conditions around the world. However, it is more important as a forage and fodder plant, considering the extent of wild and cultivated areas in countries where it is a native plant, as well as where Opuntia has become naturalized (Mondragón-Jacobo & Pérez-González, 2002). The estimated area where Opuntia grows worldwide ranges from >687 000 ha (Nobel, 1994) to 2.3 million ha (De la Cruz, 1994) the latter figure includes low-density populations scattered across northern Mexico. It has been estimated that 92% of these resources are potentially useful as stock feed. Opuntia can provide a continuous, valuable supply of fresh fodder during the dry season, given its succulent non-deciduous vegetative structure. The objective of this study was to rank the 42 Opuntia varieties available in South Africa according to palatability for dryland sheep, adapted to semi-arid subtropical conditions. The intention was not to compare the palatability of Opuntia against the palatability of other feeds, but rather to rank the palatability of the 42 different Opuntia varieties. Twenty Pedi sheep were randomly allocated to five plots of 10 x 5m to evaluate the palatability of 42 different Opuntia varieties. Four sheep were allocated to each of the five plots. The initial total sheep weight varied between 130.7 kg and 133.0 kg for the different groups. Each variety was randomly allotted within each block for five days in a different combination with two other varieties over a period of 15 days. Each variety was fed at least once in every block. Unfortunately water intake was not measured. The experiment was done at the Roodeplaat experimental farm of the ARC-Animal Production Institute (25º36'S 28º21'E). Three feeding troughs with a length of 1m were placed in different corners of the camps to prevent variety contamination and ensure enough feeding space at all times across all varieties. There was an adaptation period of two weeks prior to the onset of the trial to adapt animals to the consumption of prickly pears. All varieties fed were available ad libitum at all times. Fourteen kilograms each of three different varieties were, chopped fresh, and fed every morning at 9:00 after orts had been weighed back. Fresh drinking water was available at all times. Variety intake was measured daily. The chemical analysis was done at the accredited laboratory of The ARC-Animal Production Institute at Irene and included dry matter content, ash, crude protein, fat (ether extraction), total non structural carbohydrates (TNSC), water soluble carbohydrates (WSC), phosphorus (P), calcium (Ca), magnesium (Mg), potassium (K) and sodium (Na). PROC GLM procedure of SAS (2000) was used to determine the percentage intake in relation to different variety combinations fed to determine palatability of the Opuntia varieties. The hypothesis was that if there is no difference in palatability, the intake of the different varieties will be equal. The percentage intake was therefore determined by dividing the daily intake as is (wet base) of each variety by the daily intake of the variety mostly preferred by the sheep in each block. A value close to 100 will thus indicate that there is no difference in palatability. The average value for each variety was determined for the five days it was fed in different combinations. The varieties were rated according to these values. The variety production yield per plant was also measured during the yearly pruning at winter time by weighing the cladodes pruned from each variety. Palatability ranking of Opuntia varieties according to percentage intake, in relation to the different variety combinations fed, is shown in Table 1. All varieties were palatable and intake did not vary significantly (P <0.05) between the different varieties except for Robusta. In the case of Robusta the intake was approximately 4 kg less per camp per day. The Opuntia varieties were also rated according to their cladode production at pruning as to determine potential cladode material for feeding animals and this information is also shown in Table 1. The bush growth form produced the most cladode material at pruning. The candelabra gave the lowest cladode production per plant. From Table 1 it is clear that there is a big variation in cladode production between the different varieties under the environmental conditions at Roodeplaat. The production per plant varied from 68.3 kg in the case of the Meyers variety to 0 kg in the case of the Monterry variety. The varieties with the highest cladode production include Meyers, Tormentosa and Turpin, which has bush growth forms. Varieties with the lowest cladode production include Monterrey, Blue motto and Robusta, which do not have bush growth forms. Average daily intake varied between 11.3 kg and 13.4 kg for the four sheep, except in the case of Robusta where it was only 7.9 kg. 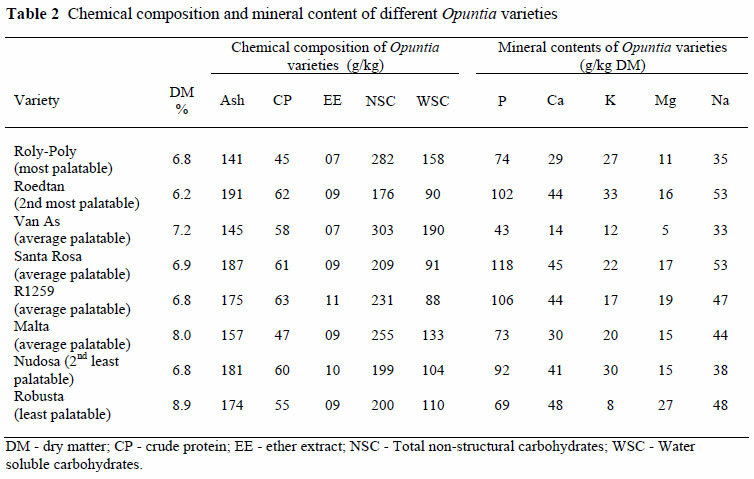 The chemical composition and mineral content of eight of the varieties chosen from the most, medium and least palatable groups, were determined and are shown in Table 2. Although differences in chemical composition where found between varieties, it do not seem to influence palatability. 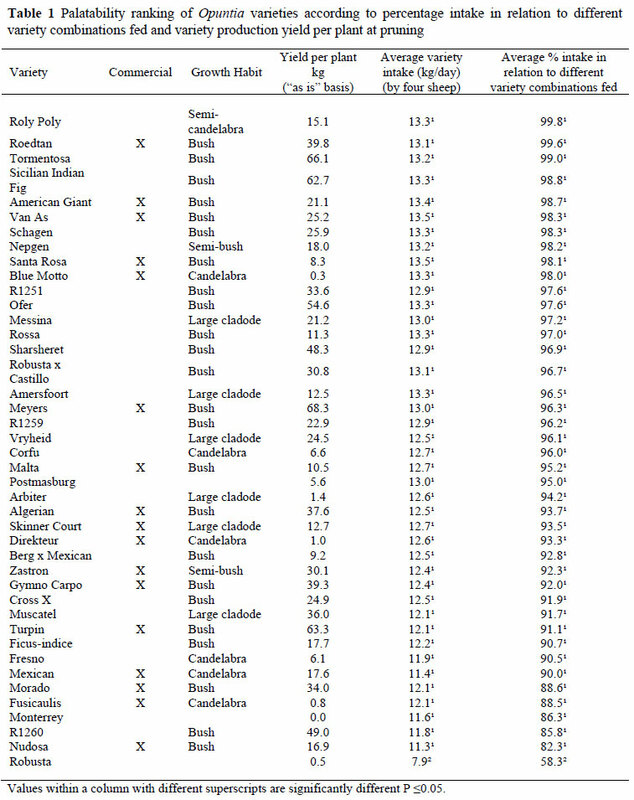 From Table 2 it was calculated that the moisture content of the different varieties varied between 91% and 94%. It is important to note that all Opuntia varieties have low fibre and protein content and has to be supplemented with a rich source of fibre and nitrogen in order to enhance animal performance. For the purpose of this trial only Opuntia were offered to study its palatability. An investigation into the production potential of Opuntia will be covered in a totally new trial, in which only palatable varieties will be included. All the Opuntia varieties seem to be palatable with the exception of Robusta. In the case of Robusta the intake was 32% lower than the average. However, there is a large variation in yield between the different varieties. The yield of the different varieties varied from 0 kg to 66 kg per plant. It is recommended that future research should concentrate on the varieties with a bush growth form since their production appears to be higher than the other growth forms. It is also recommended that further research should rather focus on the production aspects of Opuntia rather than on its palatability. Since Opuntia has low fibre and protein contents, research on its supplementation with rich sources of fibre and nitrogen in order to enhance animal performance is also recommended.